Although all notebooks come with either a touch pad or a trackpoint, many notebook users still prefer to use a mouse whenever possible. Using the built-in touch pad or trackpoint may be convenient on the go but nothing beats a mouse when it comes to accuracy and ease of use. Hence, you will find a selection of mice that were specially designed for notebook use. These notebook mice tend to be smaller and lighter. They also come with shorter cables or "tails" to reduce tangles. However, even with the reduced length, the cable still tangles easily and can be quite a hindrance. So, mouse designers went back to the drawing board and came out with two solutions - a wireless connection and a retractable cable. 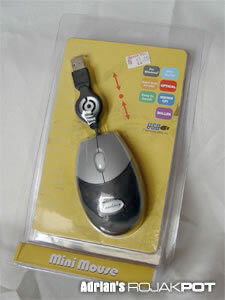 Today, we will take a look at a notebook mouse that uses the retractable cable technique - the Fantasy Mini Mouse! 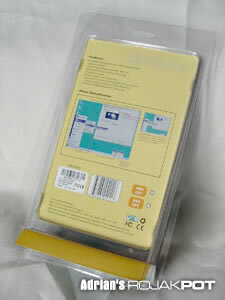 The Fantasy Mini Mouse comes in clear plastic retail packaging. You can clearly see the mouse in the front and a list of its features in the back. There are a few colours to choose from so the clear packaging allows you to check out the colour of the mouse before you buy it. The Fantasy Mini Mouse comes with a USB-to-PS/2 converter but does not come with any driver CD or floppy disk. If you are looking for the driver, you will have to download it from the company website. The model type for this mouse is MO.